Economists have been worried about what is often called the "separation of ownership and control" in large corporations since at least 1932, when Adolf A. Berle, Jr., and Gardiner C. Means wrote a book called The Modern Corporation and Private Property. The shareholders who legally own the company are technically represented by a board of directors, who then oversees the top executives who control the company on a daily basis. But when an Enron-style corporate scandal occurs, or when top executives receive very high levels of compensation, concerns arise that boards of directors have failed in their task of monitoring the firm. "In fact, most academic research, popular press accounts, and even U.S. legislation all echo the sentiment and deeply held belief that boards should be able to actively monitor and control management. ... Our review focuses on literature that directly or indirectly explores one of the core assumptions of governance research-that a correctly designed and staffed board will be able to properly fulfill its primary function of effectively monitoring managerial action. The fundamental question that we hope to shed light on is the following: Is it reasonable to expect that boards can offer effective ongoing monitoring of firms, even if we assume that directors are sufficiently qualified and motivated? ... Specifically, we outline a number of barriers stemming from information-processing challenges that ultimately inhibit directors from pro­viding effective oversight on an ongoing basis. ... Our review and assessment of the literature suggests that effective, ongoing monitoring of managerial action is unlikely in most large corporations due in large part to these varied barriers." What sort of barriers do they have in mind? For starters, effective board members should have what they call "board capital," meaning that they have personally invested the time and energy to have a fairly deep level of knowledge about the specific company, and also that board members should be compensated in a way that provides the right incentives to act in the interests of shareholders, not corporate insiders. The issues involved here are substantial! But drawing on their review of the literature on why board monitoring has often been ineffective, they argue that even when these conditions are reasonably well-met, directors typically face substantial problems in monitoring, which can stem from basic issues like firm size, firm complexity, outside job demands, complexity of those job demands, dissimilarity of those job demands, size of the board, frequency of board meetings, diversity of the board, norms of deference of the board, and power of the existing CEO. Given the research reviewed in this article, we are pessimistic about the possibility of boards being able to effectively monitor managers on an ongoing basis in many circumstances. ... Given the size and complexity of many modem firms, we believe some firms may effectively be "too big to monitor", and that successful monitoring by boards may be highly unlikely in many large public firms. It might be time to concede that our conception of boards as all-encompassing monitors is doubtful ... After many of the corporate scandals over the past several years, the initial reaction has often seemed to be "where was the board?" Our review calls into question whether boards are really equipped to catch or stop misbehavior. Governance failures are likely to often be the result of the many barriers that we have outlined in this review, rather than directors who are shirking their duty as is often assumed. What are some implications of this line of argument for corporate monitoring and the purposes of corporate boards of directors? First, it's possible to improve the ability of boards to do monitoring on all of these dimensions, and such efforts can be worthwhile. Somewhat improved monitoring by corporate boards is likely better than no monitoring by boards. Second, given that even improved board monitoring is likely to be highly imperfect, it's important to think about how to strengthen, emphasize, and rely on the other social mechanisms beyond corporate boards for monitoring the ongoing operations of firms. For example, there is analysis from investors and sources of finance like banks. There are reports of auditors, and government rules about how such audits should be done. There are articles in the financial press. Most industries have oversight in some dimensions (say, workplace safety, product safety, or environmental laws) by government regulators. There can be groups representing workers, including unions, and groups representing various community stakeholders. Third, when evaluating whether a corporate board is performing well, it may be useful to knock expectations about the extent of monitoring down to more reasonable levels. Instead, in many cases the most important aspects of a corporate board may involve tasks like "providing resource," meaning as a source of expert advice and connections to corporate management, ans well as dealing with "punctuated events" like replacing the CEO or a big decision about a merger. Bovie, Bednar, Aguilera, and Andrus write: "Consequently, we believe that future research and theorizing needs to focus on boards as advice-giving bodies, or bodies that get involved in punctuated events, and look to other corporate governance mechanisms to secure monitoring." For a quite different vision of overhauling corporate boards, a couple of years ago I discussed a proposal to "Outsource Corporate Boards?" (August 28, 2014). A common complaint against economics and economists is that their theories and outlook place an emphasis on competition, when instead they should encourage cooperation and altruism. I've offered some of my own thoughts that the supposed opposition between competition and cooperation is a false dichotomy here, and posted on the topic here and here. "The term "competition" has gathered about it evil savour, and has come to imply a certain selfishness and indifference to the wellbeing of others. Now it is true that there is less deliberate selfishness in early than in modern forms of industry; but there is also less deliberate unselfishness. It is deliberateness, and not selfishness, that is the characteristic of the modern age." "It is often said that the modern forms of industrial life are distinguished from the earlier by being more competitive. But this account is not quite satisfactory. The strict meaning of competition seems to be the racing of one person against another, with special reference to bidding for the sale or purchase of anything. This kind of racing is no doubt both more intense and more widely extended than it used to be: but it is only a secondary, and one might almost say, an accidental consequence from the fundamental characteristics of modern industrial life. "There is no one term that will express these characteristics adequately. They are, as we shall presently see, a certain independence and habit of choosing one's own course for oneself, a self-reliance; a deliberation and yet a promptness of choice and judgment, and a habit of forecasting the future and of shaping one's course with reference to distant aims. They may and often do cause people to compete with one another; but on the other hand they may tend, and just now indeed they are tending, in the direction of co-operation and combination of all kinds good and evil. But these tendencies towards collective ownership and collective action are quite different from those of earlier times, because they are the result not of custom, not of any passive drifting into association with one's neighbours, but of free choice by each individual of that line of conduct which after careful deliberation seems to him the best suited for attaining his ends, whether they are selfish or unselfish. "The term "competition" has gathered about it evil savour, and has come to imply a certain selfishness and indifference to the wellbeing of others. Now it is true that there is less deliberate selfishness in early than in modern forms of industry; but there is also less deliberate unselfishness. It is deliberateness, and not selfishness, that is the characteristic of the modern age. "Again, the modern era has undoubtedly given new openings for dishonesty in trade. The advance of knowledge has discovered new ways of making things appear other than they are, and has rendered possible many new forms of adulteration. The producer is now far removed from the ultimate consumer; and his wrong-doings are not visited with the prompt and sharp punishment which falls on the head of a person who, being bound to live and die in his native village, plays a dishonest trick on one of his neighbours. The opportunities for knavery are certainly more numerous than they were; but there is no reason for thinking that people avail themselves of a larger proportion of such opportunities than they used to do. On the contrary, modern methods of trade imply habits of trustfulness on the one side and a power of resisting temptation to dishonesty on the other, which do not exist among a backward people. Instances of simple truth and personal fidelity are met with under all social conditions: but those who have tried to establish a business of modern type in a backward country find that they can scarcely ever depend on the native population for filling posts of trust. It is even more difficult to dispense with imported assistance for work, which calls for a strong moral character, than for that which requires great skill and mental ability. Adulteration and fraud in trade were rampant in the middle ages to an extent that is very astonishing, when we consider the difficulties of wrong-doing without detection at that time. "In every stage of civilization, in which the power of money has been prominent, poets in verse and prose have delighted to depict a past truly "Golden Age," before the pressure of mere material gold had been felt. Their idyllic pictures have been beautiful, and have stimulated noble imaginations and resolves; but they have had very little historical truth. Small communities with simple wants for which the bounty of nature has made abundant provision, have indeed sometimes been nearly free from care about their material needs, and have not been tempted to sordid ambitions. But whenever we can penetrate to the inner life of a crowded population under primitive conditions in our own time, we find more want, more narrowness, and more hardness than was manifest at a distance: and we never find a more widely diffused comfort alloyed by less suffering than exists in the western world to-day. We ought therefore not to brand the forces, which have made modern civilization, by a name which suggests evil. "It is perhaps not reasonable that such a suggestion should attach to the term "competition"; but in fact it does. In fact, when competition is arraigned, its anti-social forms are made prominent; and care is seldom taken to inquire whether there are not other forms of it, which are so essential to the maintenance of energy and spontaneity, that their cessation might probably be injurious on the balance to social wellbeing. The traders or producers, who find that a rival is offering goods at a lower price than will yield them a good profit, are angered at his intrusion, and complain of being wronged; even though it may be true that those who buy the cheaper goods are in greater need than themselves, and that the energy and resourcefulness of their rival is a social gain. In many cases the "regulation of competition" is a misleading term, that veils the formation of a privileged class of producers, who often use their combined force to frustrate the attempts of an able man to rise from a lower class than their own. Under the pretext of repressing anti-social competition, they deprive him of the liberty of carving out for himself a new career, where the services rendered by him to the consumers of the commodity would be greater than the injuries, that he inflicts on the relatively small group which objects to his competition. "If competition is contrasted with energetic co-operation in unselfish work for the public good, then even the best forms of competition are relatively evil; while its harsher and meaner forms are hateful. And in a world in which all men were perfectly virtuous, competition would be out of place; but so also would be private property and every form of private right. Men would think only of their duties; and no one would desire to have a larger share of the comforts and luxuries of life than his neighbours. Strong producers could easily bear a touch of hardship; so they would wish that their weaker neighbours, while producing less should consume more. Happy in this thought, they would work for the general good with all the energy, the inventiveness, and the eager initiative that belonged to them; and mankind would be victorious in contests with nature at every turn. Such is the Golden Age to which poets and dreamers may look forward. But in the responsible conduct of affairs, it is worse than folly to ignore the imperfections which still cling to human nature. "We may conclude then that the term "competition" is not well suited to describe the special characteristics of industrial life in the modern age. We need a term that does not imply any moral qualities, whether good or evil, but which indicates the undisputed fact that modern business and industry are characterized by more self-reliant habits, more forethought, more deliberate and free choice. There is not any one term adequate for this purpose: but Freedom of Industry and Enterprise, or more shortly, Economic Freedom, points in the right direction; and it may be used in the absence of a better." 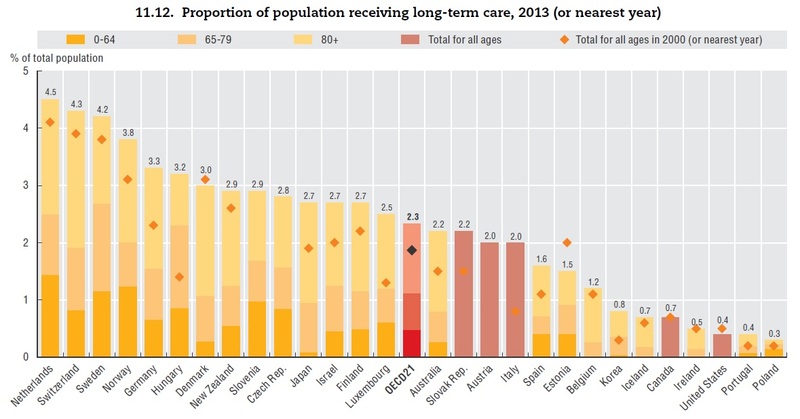 Can the US Continue to be an Outlier in Long Term Care? As population ages, it seems plausible that more people will rely on long-term care. Such care could be delivered in a variety of ways: for example, within their own home, or a specialty adapted house where care is available 24/7, or or in an institutionalized setting, and by some mixture of paid providers, volunteers, and family members. Compared with other high-income nations of the world, the US is something of an outlier when it comes to long-term care: spending less, fewer recipients of long-term care, as a result a healthier over-65 population. The figures below come from the OECD databook published last November, Health at a Glance 2015. Here's a figure showing public spending on long-term care as a share of GDP. The OECD average is 1.7% of GDP. The US spends 0.5% of GDP. The other countries that spend this little tend to have lower GDP per capita than the rest of this comparison group. The main reason for this lower level of spending on long-term care seem to be that a much smaller share of the sUS poulation is receiving long-term care. For the OECD countries with data available, an average of 2.3% of the population is receiving long-term care; for the US, it's just 0.4%. In turn, a main reason why the share of over-65 Americans receiving long-term care is so low is because, compared with other countries, the American cohort feels it's in pretty good physical shape. In the US and Canada, about 80% of the over-65 population reports being in good or very good health. For comparison, less than half of the over-65 population in for the other OECD countries is reports being in good or very good health. It's wise to take these kinds of international comparisons with a bit of skepticism. For example, the figure above shows public spending on long-term care. The Congressional Budget Office estimated in 2013 that the value of informal care provided in the US without compensation by family and friends was slightly larger than the amount of paid-for care. But other countries presumably have some long-term care that is informally provided, too. One might also wonder if Americans (and Canadians) over-65 are actually in better health than their counterparts in other countries, or just more likely to say that they are in better health. 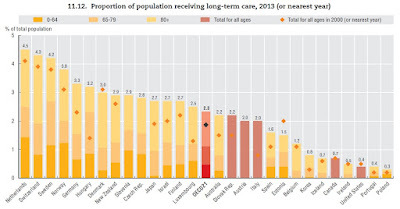 However, the US is falling so far below the average in its spending on long-term care and number of recipient of long-term care, and so far above the average in self-reported health status for the over-65 population, that it seems unlikely that either a greater prevalence of informal care or a greater degree of optimism about health status explains the difference. As I argued back in 2011, in the context of a previous OECD report, provision of long-term care is just one of many adjustments that countries will need to make in response to aging populations. The easy, costly, and unsatisfactory answer is to make it quite easy for elderly people to qualify for receiving long-term care in an institutional setting. The less costly, harder-to-implement, and more satisfactory answer is to encourage ways for people to receive only the degree of assistance they really need, so that they can live in their homes or their communities as long as possible while being supported by family and friends, but still have a backstop of public support for institutional care when needed. The "baby boom generation" refers to those born from roughly 1945-1960. Thus, members of that group will be turning 65 over the 15 years from 2010 to 2025, and will be reaching 80 over the 15 years from 2025 to 2040. As that generation ages, designing and implementing long-term care policies will be a continual work in progress. A long-planned family vacation had me visiting in Great Britain last week during the Brexit vote. Here are some reflections on the event, in no particular order. 1) The Brexit vote seemed to me a strangely American moment. Some of the lasting slogans handed down from the American revolution against England are "no taxation without representation" and "don't tread on me." Thus, for an American there was some historical irony in hearing many of the British argue, in effect, that there should be "no regulation without representation," or perhaps "no legislation without representation." There was similar irony in hearing some of the British turn loose their "don't tread on me" spirit while railing against annoying but in some sense small-scale regulatory impositions from the central power, like rules that sought to standardize shapes and sizes for fruit and vegetable produce, or the rules with force of law that sales of loose and packaged good use only metric measurements. I found myself half-expecting some "Leave" advocates to start quoting the US Declaration of Independence: "When in the Course of human events, it becomes necessary for one people to dissolve the political bands which have connected them with another, and to assume among the powers of the earth, the separate and equal station to which the Laws of Nature and of Nature's God entitle them ..."
2) There was a widespread feeling, even among the Remain supporters with whom I spoke, that the nature of the European project had mutated over time. My sense was that many of the Leave voters were (mostly) fine with the progress of the greater European project from the founding of the European Economic Community back in 1957 up through the 1980s. But after the effort had transmogrified into the European Union in 1993, the project was no longer focused on facilitating trade between nations. Instead, it had become focused on an agenda of gradually erasing national boundaries, or in the phrase often-used, a push for "ever-closer union," which pushed beyond the comfort level of many of the British. For example, when the European Union describes its own history, it refers to early participants in the European project back in the 1950s as "Founding Fathers," a phrase with a strong resonance for Americans of those who seek to create a single nation. The EU website also describes how the 1957 treaty aimed at a "common market" between countries, while the 1986 update treaty aimed at a "single market." The concept of a common market as defined by the Court in a consistent line of decisions involves the elimination of all obstacles to intra-Community trade in order to merge the national markets into a single market bringing about conditions as close as possible to those of a genuine internal market. It is important that not only commerce as such but also private persons who happen to be conducting an economic transaction across national frontiers should be able to enjoy the benefits of that market. "To found a great empire for the sole purpose of raising up a people of customers may at first sight appear a project fit only for a nation of shopkeepers. It is, however, a project altogether unfit for a nation of shopkeepers; but extremely fit for a nation whose government is influenced by shopkeepers." "England purchased for some of her subjects, who found themselves uneasy at home, a great estate in a distant country. The price, indeed, was very small, and instead of thirty years purchase, the ordinary price of land in the present times, it amounted to little more than the expence of the different equipments which made the first discovery, reconnoitred the coast, and took a fictitious possession of the country. The land was good and of great extent, and the cultivators having plenty of good ground to work upon, and being for some time at liberty to sell their produce where they pleased, became in the course of little more than thirty or forty years (between 1620 and 1660) so numerous and thriving a people that the shopkeepers and other traders of England wished to secure to themselves the monopoly of their custom. Without pretending, therefore, that they had paid any part, either ofthe original purchase-money, or of the subsequent expence of improvement, they petitioned the parliament that the cultivators of America might for the future be confined to their shop; first, for buying all the goods which they wanted from Europe; and, secondly, for selling all such parts of their own produce as those traders might find it convenient to buy. For they did not find it convenient to buy every part of it. Some parts of it imported into England might have interfered with some of the trades which they themselves carried on at home. Those particular parts of it, therefore, they were willing that the colonists should sell where they could; the farther off the better; and upon that account purposed that their market should be confined to the countries south of Cape Finisterre. A clause in the famous act of navigation established this truly shopkeeper proposal into a law. "The maintenance of this monopoly has hitherto been the principal, or more properly perhaps the sole end and purpose of the dominion which Great Britain assumes over her colonies." A second twist is that that Napoleon (who was familiar with Smith's writings) is reputed to have snarked that England was not a worthy opponent in war, because it was merely "a nation of shopkeepers. There doesn't seem to be much evidence that Napoleon ever actually made this comment, but as the legend metamorphosed into what people thought they remembers, some in England began to treat Napoleon's intended insult about "nation of shopkeepers" as mark of pride. Indeed, news stories in recent years point out British government ministers who now argue that the country should become "a nation of shopkeepers," by which they mean entrepreneurs, along with poll results suggesting that "shopkeeper" is viewed as a quite desirable job. Clearly, applying Smith's argument to the Brexit phenomenon in any direct way is a stretch! But it is true that in Smith's usage, Britain was a nation of "shopkeepers" who expected their government to cut them a profitable deal in world markets--and the seeming inability of the British government to cut such deals was part of the fuel for the "Leave" forces. 4) A comment I heard several times from "Leave" proponents is that the United Kingdom has fifth-largest economy in the world, and even outside the EU, it will remain an important player in the global economy. This argument strikes me as whistling in the dark. Yes, if GDP across countries is compared at market exchange rates, the United Kingdom ranks fifth (after the US, China, Japan, and Germany). But world GDP isn't a race, where finishing 5th of the 195 economies where the World Bank estimates a GDP level gives you a prize. Absolute size matters, and the UK is only about 3.8% of the global economy by size. In other words, if countries don't want to deal with the UK for whatever reason, there are lots of other options out there. If one compares GDP across countries using "purchasing power parity" exchange rates, then the UK ranks only 10th in the world, and is 2.4% of the total world economy. One of the main economic justifications for the EU is that with an internal market of more than 500 million people, and with a total GDP exceeding either the US or China (at market exchange rates), members will be better-positioned both to trade within the group and to be part of better deals negotiated outside the group. 5) Along with issues of democratic representation and the possibility of negotiating alternative international agreements, the other big issue in the Brexit vote concerned immigration. Here are a couple of graphs from the "Migration Statistics Quarterly Report: May 2016" published by the UK government. From 1970 up to the early 1990s, immigration and emigration were roughly equal in the UK. 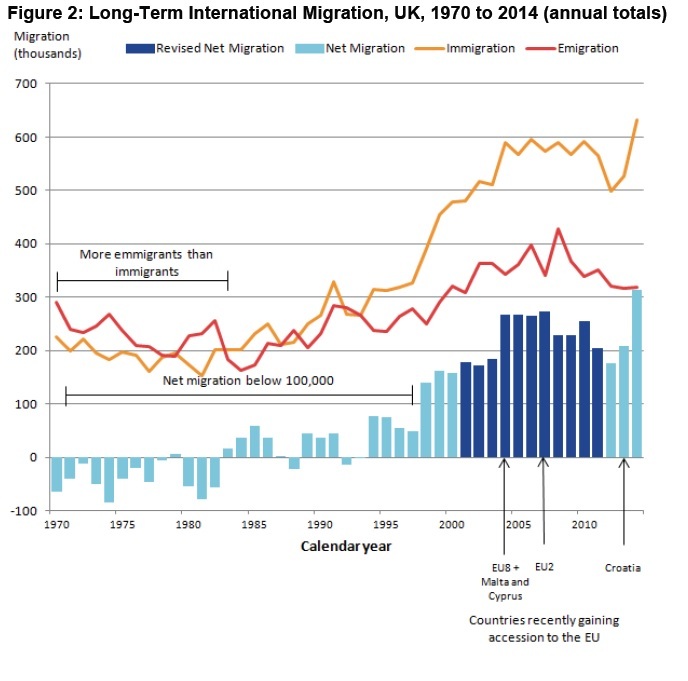 But then immigration rises rapidly, and in many year there is overall net in-migration of 200,000 per year or more. Are Britain's migrants coming from inside the EU or outside? 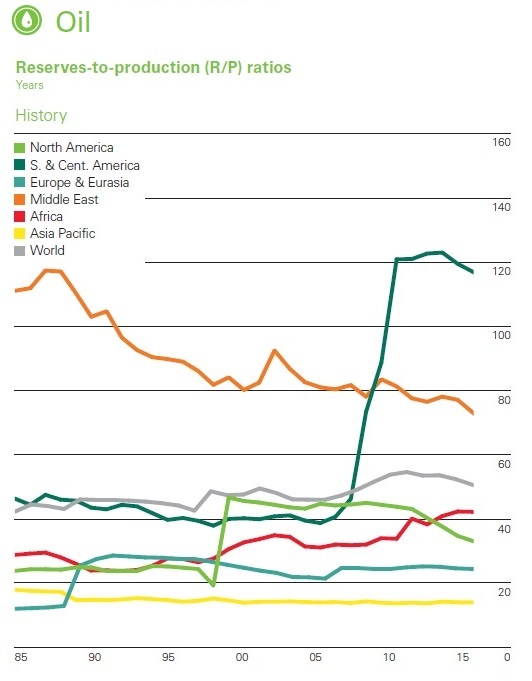 This figure shows "net" migration--that is, immigration minus emigration--for various groups. 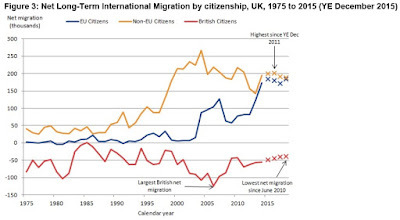 You can see that in starting around 1997, the main surge in net migration was at first from outside the EU, a change often said to be triggered by pro-immigration policies adopted by the government of then-Prime Minister Tony Blair. However, in since about 2010, net migration from within the EU has stepped up as well. After 2004, a substantial share of this migration from inside the EU was from eastern European countries. In the last few years since 2010, there has been increased immigration to the UK from countries in the so-called EU-15, which are the countries that were members of the EU up to early 2004, as well as from Romania and Bulgaria. 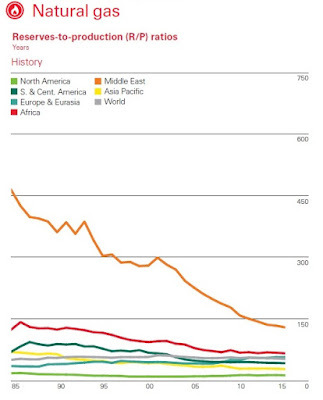 Thus, greater immigration had a fairly modest affect on the UK through the earlier decades of the European project, up through the 1990s. 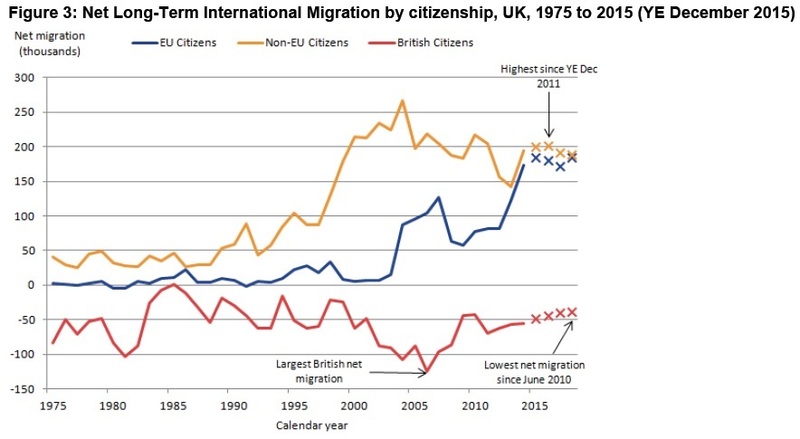 The big change in UK immigration around 1997 was mostly a result of decisions by Britain's government, not imposed by the EU. It was also a decision of Tony Blair's government, not imposed by the EU, to allow workers from the eastern European countries joining the EU after 2004 to work in the United Kingdom. Although the more recent issues about refugees from Syria and north Africa who are seeking asylum in Europe and the United Kingdom have clearly added heat to the immigration issue, the underlying message here is that immigration--a rising share of it from within poorer countries of the European Union--has been shaking up the UK economy for the last 20 years. The paper is not concerned with the intra-EU migration and social rights of EU citizens who are not workers, a group that has recently been much discussed in debates about alleged “benefit tourism”. This usually refers to claims that EU citizens move to other EU countries for the primary purpose of accessing benefits rather than working and contributing. Although popular in media and public debates across the EU, there is little evidence to support this claim. In the UK, for example, there is no evidence to support the idea that access to the welfare state is a major driver of EU immigration and EU migrants are significantly less likely than UK workers to access out-of-work benefits. In any case, the great majority of EU migrants across EU member states are labour migrants who qualify as “workers”. Most economic studies (although not all) suggest that the native population of a country as a whole benefits from immigration. However, those who find themselves in most direct competition for jobs with the new migrants are more likely to incur costs. And the UK labor market and welfare policies, relative to the other high-income economies in the EU, are set up in a way that will raise the economic tensions from a more-open immigration policy. .
6) After the vote, a number of "Remain" proponent often emphasized that the margin seemed very narrow. I disagree. In big elections with millions of voters, a 51.9% to 48.1% vote is actually pretty decisive. In absolute terms "Leave" won 17.4 million votes and "Remain" had 16.1 million. Thus, it would have taken a swing of something like 700,000 voters to alter the outcome--and that's a lot of voters. As another perspective, President Obama won reelection in 2012 over Mitt Romney with 51.9% of the two-party vote, and that isn't (and shouldn't be) thought of as a narrow marginal victory, either. 7) Finally, consider in broadest terms the many ways in which the relationship between the United Kingdom and European Union, or between the United Kingdom and various subsets of European countries, might be arranged. Such relationships have many possible dimensions, involving trade, competition policy, environmental policy, immigration policy, workplace regulation, welfare policies, spending, taxes, monetary policy, and others. This very multidimensional set of policy choices can't really be distilled into a binary choice labelled either "Leave" or "Remain." The Brexit vote doesn't determine what the eventual outcome of the renegotiated relationships between the countries will be, but it may alter the default negotiating positions of the two sides. In some sense, it's similar to the change that occurred in marital divorce laws. When divorce required that one party be found to be at "fault," the person in the marriage who least wanted to divorce had greater power to block the divorce. When divorce shifted to "no-fault," the party who wanted to get divorce had more power in the negotiation that followed. Similarly, before the Brexit vote, the presumption in Britain's negotiations with the EU, or other countries around the world, was that Britain would more-or-less follow the consensus of the rest of the EU. With that negotiating position, the European Union wasn't willing to concede much at all to Britain's Prime Minister David Cameron in negotiations before the Brexit vote. After the vote, the presumption will be that Britain will not follow the group, so any negotiations either with the EU or with other countries will have a different tone. The default negotiating position will be shifted. The United Kingdom will have less leverage in cutting international deals than the EU as a whole, but it will also gain greater flexibility. China’s high growth has boosted global growth in recent years (Figure 1.3). From 2011 to 2015, China’s relative contribution to global growth was on a par with advanced countries, despite stagnating at a high level for a decade. 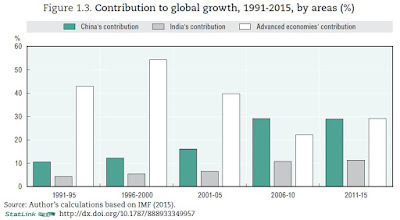 India’s contribution to global growth has also risen since the early 2000s. 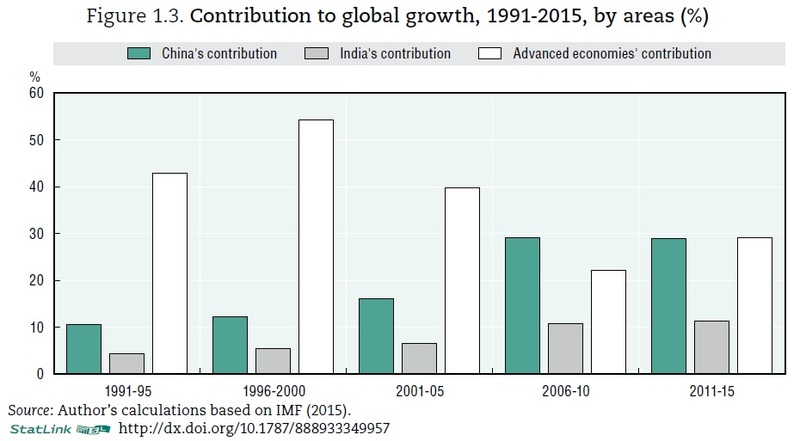 However, China has contributed almost 30% to global growth in recent years, approximately 20 percentage points more than India. As India is more closed and still considerably poorer than China, it cannot yet offset the impact of China’s slowdown on global growth and trade." I still fairly often run into an implicit attitude that the US, or perhaps the US and the rest of the high-income countries taken together, dominate the global economy and can set the rules. That's a very twentieth-century point of view. 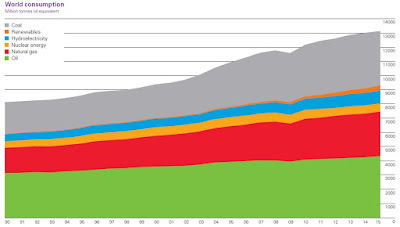 Global population is now almost 7.3 billion. But almost two millennia in the past, when total world population was (roughly) 200 million people, concerns about overpopulation were already being expressed. Of course, the fact that a writer in 200 AD had some mistaken views that the "teeming population" had already overwhelmed the natural resources of the the world doesn't mean that modern writers with similar views are incorrect in their concerns. Similarly, the fact that the economist Thomas Malthus was expressing concerns about global overpopulation back around 1800 when the world population had reached about 800 million doesn't doesn't mean that modern writers with similar views are incorrect in their concerns, either. But these examples of the ongoing fear of overpopulation, and many more examples that can be given through history, do suggest that worries about overpopulation--together with an inability to imagine how the population might be fed--may represent an internal bias that is baked deeply into the human psyche. Sometimes biases turn out to be right, eventually--after all, even a stopped clock shows the correct time twice each day--but it's still worth being aware of their existence. "It still remains to speak of one of the principal causes which make diversity of opinion advantageous, and will continue to do so until mankind shall have entered a stage of intellectual advancement which at present seems at an incalculable distance. We have hitherto considered only two possibilities: that the received opinion may be false, and some other opinion, consequently, true; or that, the received opinion being true, a conflict with the opposite error is essential to a clear apprehension and deep feeling of its truth. But there is a commoner case than either of these; when the conflicting doctrines, instead of being one true and the other false, share the truth between them; and the nonconforming opinion is needed to supply the remainder of the truth, of which the received doctrine embodies only a part. "Popular opinions, on subjects not palpable to sense, are often true, but seldom or never the whole truth. They are a part of the truth; sometimes a greater, sometimes a smaller part, but exaggerated, distorted, and disjoined from the truths by which they ought to be accompanied and limited. Heretical opinions, on the other hand, are generally some of these suppressed and neglected truths, bursting the bonds which kept them down, and either seeking reconciliation with the truth contained in the common opinion, or fronting it as enemies, and setting themselves up, with similar exclusiveness, as the whole truth. The latter case is hitherto the most frequent, as, in the human mind, one-sidedness has always been the rule, and many-sidedness the exception. "Hence, even in revolutions of opinion, one part of the truth usually sets while another rises. Even progress, which ought to superadd, for the most part only substitutes, one partial and incomplete truth for another; improvement consisting chiefly in this, that the new fragment of truth is more wanted, more adapted to the needs of the time, than that which it displaces. "Such being the partial character of prevailing opinions, even when resting on a true foundation, every opinion which embodies somewhat of the portion of truth which the common opinion omits, ought to be considered precious, with whatever amount of error and confusion that truth may be blended. No sober judge of human affairs will feel bound to be indignant because those who force on our notice truths which we should otherwise have overlooked, overlook some of those which we see. Rather, he will think that so long as popular truth is one-sided, it is more desirable than otherwise that unpopular truth should have one-sided asserters too; such being usually the most energetic, and the most likely to compel reluctant attention to the fragment of wisdom which they proclaim as if it were the whole." Ticket-splitting refers to when a voter casts, say, a ballot for the presidential candidate from one party while also voting for a congressional candidate from another party. Obviously, a lot of factors about specific candidates and specific election will influence the extent of ticket-splitting. But at least in some broad sense, one can think of ticket-splitting as a willingness to consider candidates from both parties. 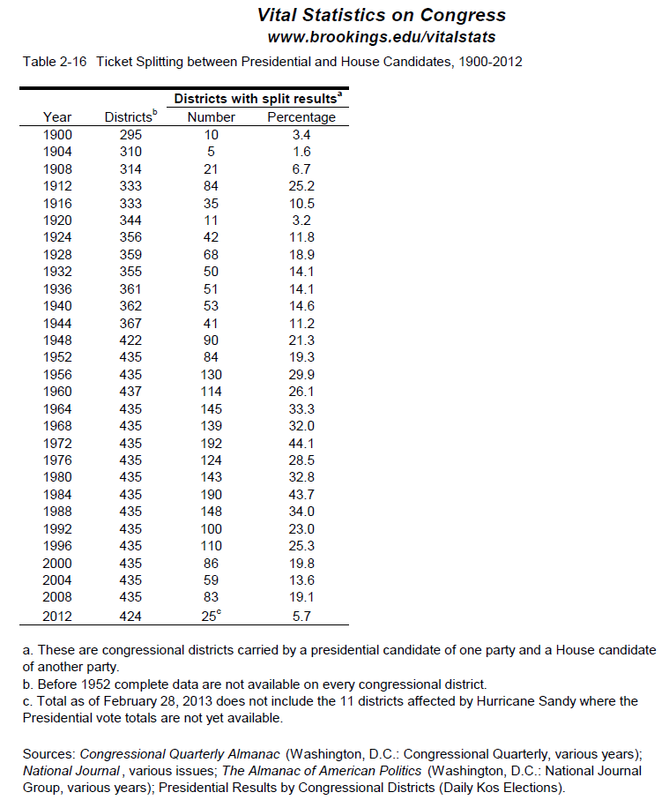 Norm Ornstein, Tom Mann, and Michael Malbin offer some historical sense of the amount of ticket-splitting in some tables in their 2013 databook, Vital Statistics on Congress. 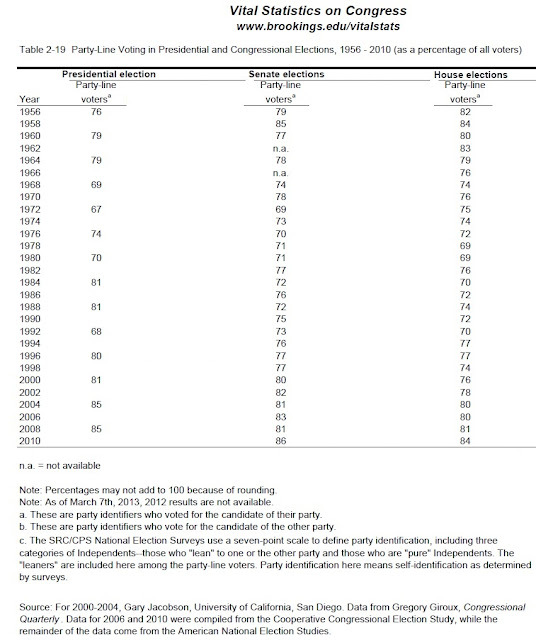 Here's a table showing the percentage of voters who cast a ballot for a presidential candidate from one party and a House of Representatives candidate from the other party for all presidential elections going back to 1900. What jumps out from the table? 1) The amount of ticket-splitting in 2012 was very low by historical standards. 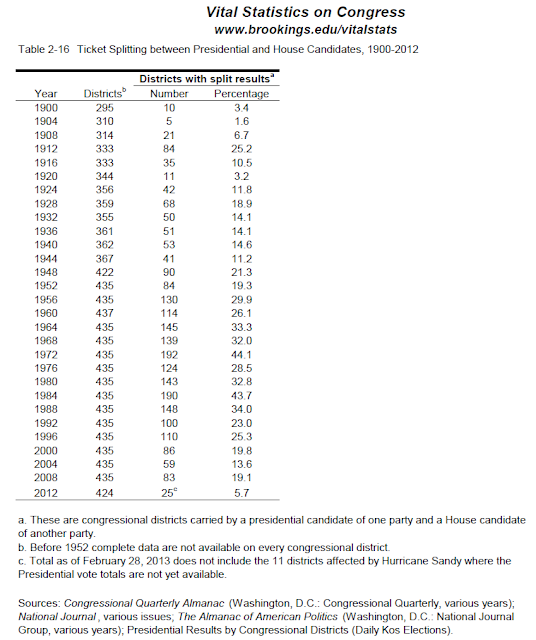 Not quite the lowest, because there was even less ticket-splitting in 1900 and 1904. But low. Moreover, the last four presidential elections going back to 2000 have had relatively low levels of ticket-splitting compared to other post-World War II elections. 2) The two years with the highest level of ticket-splitting were also years in which a presidential candidate won in a landslide. More or less by definition, winning by a landslide means picking up a lot of voters of the other party--but many of those voters presumably split their ticket and voted for a Congressman of their own party. Thus, the biggest years for ticket-splitting, according to this measure, were the Reagan wipeout in 1984, the Nixon landslide in 1972. 3) I don't know how to interpret this pattern, but it's interesting that the amount of ticket-splitting was about the same for the first-term election of Bush in 2000 and the first-term election of Obama in 2008, and then the amount of ticket-splitting diminished for both candidates in their second-term election. 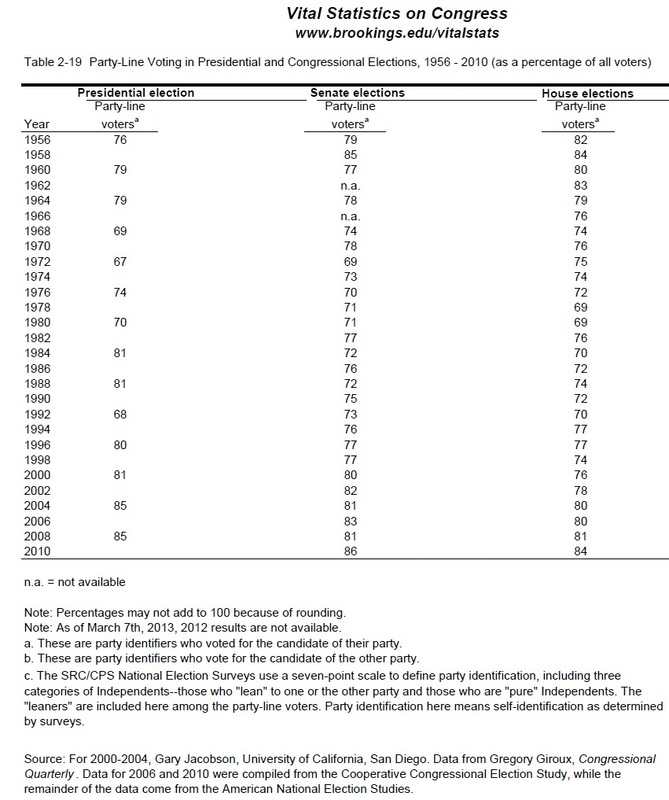 Here's another Ornstein, Mann, and Malbin chart on ticket-splitting. (In this one, I cut a few of the columns to make it easier to focus on some main themes.) In this measure, voters are asked a series of questions to classify their party leanings. The question then is what share of voters cast a ballot aligned with their partisan preferences in presidential, Senate, and House elections. 1) Again, the general pattern is toward people being more likely to vote in a way that follows their partisan beliefs. The last few elections show partisan beliefs being followed by more than 80% of voters, which is higher than was common from the 1960s through the 1990s (although elections back in the late 1950s had a similar degree of partisanship). 2) There doesn't seem to be a clear pattern of partisanship being stronger in presidential than in congressional elections, or vice versa. It does appear that the extent of partisan voting across these three types of elections tends to rise and fall together--that is, some elections are more partisan at all levels than others. It seems to me that some of those who bewail a high degree of political polarization and partisanship are also people who may almost never have voted for someone outside their own preferred party--no matter what actual person is running on their party's ticket. If a politician switched parties, their beliefs about that politician would also switch. In other words, they are opposed to partisanship on the other side, but not their own. Personally, I'm all for a healthy amount of partisanship, as long as its not just voting for the clothing, and is rooted in actual beliefs and skills of particular candidates. 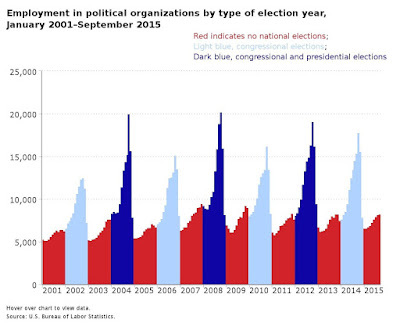 How Many Jobs in the Political Organizations Industry? The relatively small size of the number, compared with the amount of attention, surprised me. Although the total number of jobs for people being professional athletes appears to be only about 13,700, and that group generates a lot of attention from the rest of us, too. When it comes to measuring inflation, the Consumer Price Index gets most of the attention. 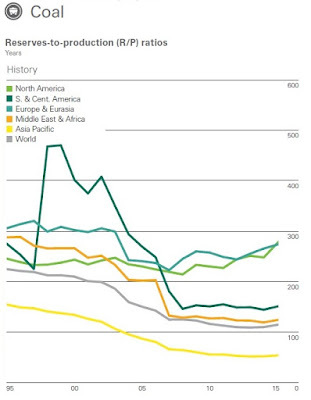 But while the CPI just celebrated its centenary a couple of years ago, its elders sibling the Producer Price Index is celebrating its 125th anniversary this year. 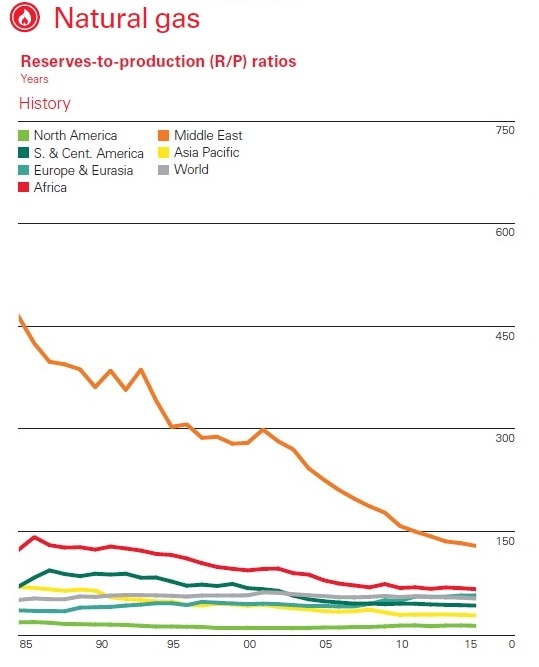 Lana Conforti offers an overview of "The first 50 years of the Producer Price Index: setting inflation expectations for today," in the June 2016 issue of the Monthly Labor Review, which is published by the US Bureau of Labor Statistics. For answers to questions about how the PPI now operates, a useful starting point is the BLS FAQs page on on the PPI. Resolved, The Committee on Finance be, and they are hereby, authorized and directed, by subcommittee or otherwise, to ascertain in every practicable way, and to report from time to time to the Senate, the effect of the tariff laws upon the imports and exports, the growth, development, production, and prices of agricultural and manufactured articles, at home and abroad…. There was no expectation that the members of the committee would agree about the political or even the economic bearings of the facts ascertained; but all were desirous that hereafter there should be no reason to question the integrity of the facts. As soon as you have completed the collection of wages and prices in [your city], please collect the quotations for wholesale prices….You can change the word “retail” to “wholesale” and make the blank conform. By “wholesale prices” I mean…the prices to jobbers. The data produced by the BLS committee were published in Senator Aldrich’s 1892 report, which showed that prices fell 0.3 percent from June 1889 to September 1891. After this first publication, in 1893, the Senate committee and BLS completed their initial mission by publishing a report on historical prices for the years 1840–90. This massive compilation was the first of its kind in U.S. history and was made possible only by the dedicated efforts of field economists and with cooperation from the business community. After several years of planning, in 1900, BLS published Wholesale Prices, 1890 to 1899, the first publication produced without congressional oversight. But it wasn’t until March 1902 that the regular annual publication of Course of Wholesale Prices (hereafter referred to as Wholesale Prices) began. In the 1990s and early 2000s, the US monthly trade surplus in services (that is, the amount the red line is above the blue line) was typically in the range of $8 billion per month: in the last few years, it's been more like $18 billion per month. It's likely that the predominant area of growth in US trade in the future will come from exporting services--managerial expertise, legal, financial, entertainment, technological, design, logistics--rather than physical objects. This figure shows that exports of services used to be about 27-29% of exports of goods-plus-services combined, but the share of services in total goods-and-services exports is now above 33% and rising. A fair number of Americans and politicians argue that a trade deficit is in large part a result of unfair trade practices by other countries. Essentially all actual economists disagree with that claim. Economists instead see trade deficits are arising from broad patterns of national production, consumption, and saving. A low-saving economy like the US consumes more than it produces--which it can do by running a trade deficit and importing more than it exports. A high-saving economy produces more than it consumers--which it can do by running a trade surplus and exporting more than it imports. Unfair trade practices can certainly restrict overall flows of trade, but they aren't a main cause of trade deficits and surpluses. That said, I wonder how many of those who think that trade deficits are a result of unfair trade practices by other countries are willing to stick to the logic of their position when it comes to US trade surpluses in services. If trade surpluses are a sign of unfair trade practices, then doesn't the ongoing US surpluses in services trade prove that the US is using unfair trade practices in services? My own sense is that too much attention gets focused on whether other countries are trading unfairly, and not nearly enough attention gets focused on how US producers can hook themselves up to the faster economic growth rates happening in the emerging economies of the world. An enormous number of pixels are spent on renewable energy, but when one looks at actual numbers, we are still living in a fossil fuel world. 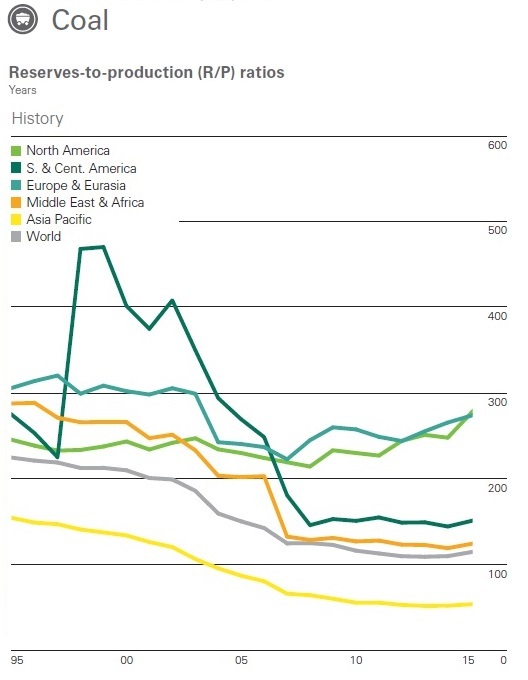 Here are some illustrative charts from the most recent annual BP Statistical Review of World Energy, released June 2016. Back in 1938, Roy Harrod delivered the Presidential Address for the British Economic Association on the topic "Scope and Method of Economics." It was published in the September 1938 issue of the Economic Journal, which at the time was edited by John Maynard Keynes, and and thus led to some friendly back-and-forth between them. I'll highlight three parts of the exchange here. 1) At the start of Harrod's talk, he readily acknowledges the concern, which I hear often among economists, that actually doing economic research is what's interesting, and methods can only be judged after their results are known, so talking about what methods should be used in future research is a waste of time. Here's Harrod on why many economists actively seek to avoid discussion methodological issues. In my choice of subject to-day, I fear that I have exposed myself to two serious charges: that of tedium and that of presumption. Speculations upon methodology are famous for platitude and prolixity. They offer the greatest opportunity for internecine strife; the claims of the contending factions are subject to no agreed check, and a victory, even if it could be established, is thought to yield no manifest benefit to the science itself. The barrenness of methodological conclusions is often a fitting complement to the weariness entailed by the process of reaching them. The principles by which progress in a science proceeds can only be reached by observing that progress. They cannot be deduced a priori or prescribed in advance. ... And for this reason the methodologist is bound to occupy the rear, and not the vanguard. He studies the specific nature of the selected principles after the selection has been made. ... The function of the methodologist is to say what it in fact is, or, more strictly, has so far been. The proper and final reply to the would-be reformer is, " Stop talking and get on with the job; apply your method, and, if it is productive, you will be able to display your results." 2) There's a widespread quick-and-dirty version of the relationship between theory and empiricism in economics, which is that one first creates theories, tests those theories with data, and then iterates with new theories and empirical tests. But in the 21st century, I'm not sure anyone really believes this. It's well-known that you can create an internally consistent theory to reach pretty much any conclusion you want, as long as you tinker with the underlying assumptions. Moreover, it's well-known that when doing empirical work, one can try out a bunch of different statistical tests until you find one that reaches the conclusion you want. To make matters worse, there's no particular reason to believe that if some particular economic theory is validated by some particular empirical estimate in one context that it will also hold true in all other times and places. These concerns prove the case that a social science is not a natural science, but it would be as severe overreaction to hype them up into a claim that social sciences can't lead to meaningful knowledge. 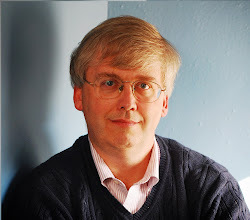 Much of Harrod's essay is aimed at an argument that economists can and should strive for general insights applicable in a number of settings. I'll include here a quotation from Keynes, in their correspondence, in which Keynes argues for a central task for economists is weeding through models and choosing the applicable one--and that empirical tests offer only limited help in this task. This is part of a letter from Keynes to Harrod, upon receipt of the draft of Harrod's talk, dated July 4, 1938. It is taken from a website, "The Collected Interwar Papers and Correspondence of Roy Harrod," edited by Daniele Besomi. It's letter #787 at that website, and it's easy to click from letter to letter through the correspondence. Progress in economics consists almost entirely in a progressive improvement in the choice of models. ... But it is of the essence of a model that one does not fill in real values for the variable functions. To do so would make it useless as a model. For as soon as this is done, the model loses its generality and its value as a mode of thought. ... The object of statistical study is not so much to fill in missing variables with a view to prediction, as to test the relevance and validity of the model. Zealous humanitarians may be impatient for quick results. All men of goodwill may see without more ado that there is much amiss with the world. Should not social students postpone their abstruse intellectual problems, of fascination mainly to themselves, and get together in a sort of academic tea-party to list our known abuses and our known resources and arrive at a programme of reform on the basis of mutual goodwill ? And do they not in fact, so the critic proceeds, bury themselves in unintelligible jargon, because they fear that, if they proceeded with their more immediate duties, they would disturb vested interests, incur social odium and signally fail to feather their own nests ? The criticism misconceives the duty of the student and the true source of his power for good. It may be the case that much could be put to rights without further scientific knowledge. But the sociologist will agree that if known abuses are not redressed it is not for lack of a catalogue of them, or even for lack of men of goodwill. ... [H]is experience will lead him to suspect that the equilibrium is not likely to be shattered by the breath of an academic tea-party. Nor have academic students a monopoly of goodwill or the power to express it. and abstruse demonstrations, far removed from the common light of day, in order to emerge finally with a generalisation which may then be re-translated into the language of the workaday world. When it comes to processing transactions and borrowing money, the financial system works beautifully for my family. The bank doesn't charge us for depositing checks or withdrawing money, and we have enough money in the bank to qualify for a "free" checking account. The annual fee for our credit cards is smaller than the benefits they offer in terms of airline tickets, hotel rooms, and money back, so that as long as we make the payments on time, we come out ahead each year. Getting a home mortgage or a car loan is straightforward. If I needed a serious chunk of emergency cash, I could take out a home equity loan. But for many low-income Americans, the financial system imposes additional costs that make it a harder for households that are already struggling to make ends meet. If they don't have a bank they pay for cashing checks and they pay for money orders. If they do have a bank account or credit cards, they often end up paying overdraft fees at the bank or late fees to the credit card company. Getting a home loan or a car loan is somewhere from difficult-and-costly to impossible. If they need short-term cash, they end up turning to pawn shops, payday loans. The Council of Economic Advisers offers some background on these issues in its June 2016 Issue Brief, "Financial Inclusion in the United States." 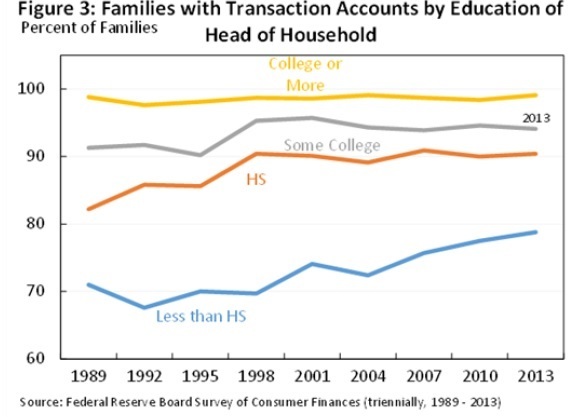 As a starting point, here are a couple of figures showing the trends in whether households have a "transaction account"--basically, a bank account. 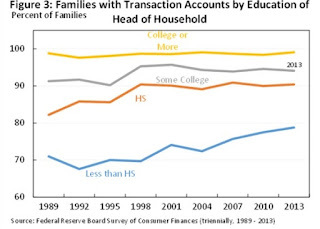 The share of households with a bank account is rising, but for families in the lower income percentiles, or for families with lower education levels (of course, these are often the same families), the chance of having a bank account remains substantially lower. 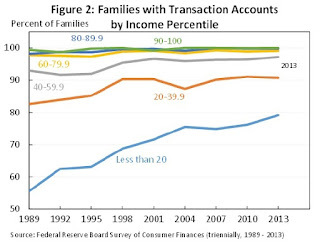 These families face out-of-pocket costs when dealing with the financial system. 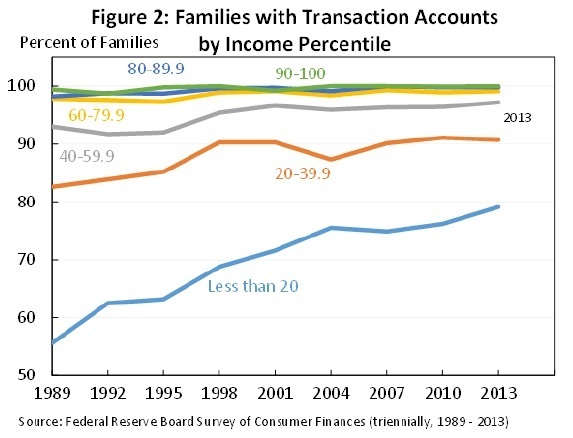 Unbanked and underbanked households also face additional costs due to their reliance on other, non-mainstream financial services, such as payday loans (used by roughly 5 percent of households in 2013) and auto title loans (used by roughly 0.6 percent of households in 2013), among other forms of so-called small dollar credit. These products’ costs can be quite substantial—anywhere from $10 to $30 in extra costs per $100 borrowed in the case of payday loans. My main quibble with the report is its use of the currently fashionable term of "financial inclusion." As the text of the report notes, the underlying issues here are more prosaic and obvious than a broad term like "inclusion" might suggest. There are ways to address some of these issues, like the widespread shift toward having government checks paid directly to bank accounts, rather than delivered through the mail, which can create a tie to a bank for those who have not previously had such a connection. But most of the new financial technology firms or smartphone applications that one reads about require overcoming these more basic hurdles. Despite the potentially adverse impacts that arise from a reliance on unconventional sources of small dollar credit, these products provide a source of funds for households who might not otherwise be able to cover such crucial but often unanticipated expenses as emergency medical treatment, funeral and burial preparations, and urgent home or automobile repairs, or sometimes even to cover regular expenses. These types of products often take the place of conventional accounts. ... Moreover, some households depend on access to small-dollar credit not just for big, one-time expenditures but also for covering general, day-to-day living expenses, such as rent and utility payments. One survey found that 2 in 5 title loan users report using the borrowed funds for rent or utilities while about a quarter of borrowers used the loan for medical expenses or car repairs. It's easy enough to deplore how these small-dollar credit institutions operate, and how people start by taking out one loan and end up trapped in a web of ever-growing debts. (Incidentally, the public sector isn't innocent here, either, with a growing practice in recent years of imposing ever-greater fines, and then additional fines for not paying the earlier fines on time, which can weigh heavily on low-income families.) I've written here in the past about the issues with payday loans, in particular (for example, here, here and here). But those with low incomes who are facing a sudden need for cash--an emergency medical costs, or a car repair that's the difference between getting to work or not, or the possibility of having their power and water cut off, or being evicted from an apartment--may not have any especially appealing options. Before acting to limit or reduce the options that they do have, like the recent rules that seek to limit payday lending, it's useful to think about what is going to happen to some of the people who can't get that loan they need. Aaron Klein of the Brookings Institution offers a useful primer on these issues in "Understanding non-prime borrowers and the need to regulate small dollar and "payday" loans," a short, readable paper published on-line on May 19, 2016. If almost every time the police stopped and frisked someone, they found an illegal weapon or drugs, or identified a wanted criminal, then complaints about the practice would ring hollow. On the other hand, if the police almost never found evidence of a crime during a stop and frisk, then complaints about the practice would take on a sharpened urgency. Other evidence would be nice, too. It would be nice to know on what grounds the police are making decisions to stop and frisk, and whether some reasons for stop and frisk are more likely or less likely to lead to evidence of a crime. It would be nice to know the extent to which the well-known racial differences in stop-and-frisk are related to the practice occurring more in higher poverty, higher crime areas, which also have a racial imbalance. It would be nice to have some evidence on whether stop-and-frisks are more likely to lead to evidence of a crime for whites or blacks. Sharad Goel, Justin M. Rao And Ravi Shroff offer some evidence and analysis on these kinds of questions in their research paper "Precinct Or Prejudice? Understanding Racial Disparities In New York City’s Stop-And-Frisk Policy," which appeared earlier this year in the Annals of Applied Statistics (2016, 10:1, 365–394). "Following a stop, officers complete a UF-250 stop-and-frisk form, recording various aspects of the stop, including demographic characteristics of the suspect, the time and location of the stop, the suspected crime and the rationale for the stop (e.g., whether the suspect was wearing clothing common in the commission of a crime). ... After an individual is stopped, officers may conduct a frisk (i.e., a quick patdown of the person’s outer clothing) if they reasonably suspect the individual is armed and dangerous; officers may additionally conduct a search if they have probable cause of criminal activity. Frisks and searches occur in 56% and 9% of cases, respectively. An officer may decide to make an arrest (6% of instances) or issue a summons (6% of instances), all of which is recorded on the UF-250 form." Of course, it's sensible to be skeptical about the quality of this evidence. For example, one might raise questions about how frequently or accurately these UF-250 forms are filled out. One answer to this concern is that because of past court cases, the NYPD has some explicit emphasis on filling out the forms, and filling them out accurately. Also, with data on several million forms, one should be able to learn something, even if lessons should be drawn with appropriate caution. The researchers focus most of their discussion in this study on the 760,000 cases where the reason for the stop was suspicion of criminal possession of a weapon. This group of stops is useful to study because it's the largest single reason for such stops, and because the data shows whether a weapon was actually found, or not, which focuses on a specific crime, rather than jumbling all crimes together. The authors look at data mostly from 2009-2010, and calculate what factors listed on the UF-250 form--including personal characteristics of the suspect, the specific factors that the officer observed that led to the stop, and the location as determined by the police precinct-- make it more or less likely that a weapon was actually found. The result is a big messy statistical calculation, which for 2009-2010 includes 301,000 stops and 7,705 different variables (the large number of variables is because they look at a bunch of potential variables both individually and in how the variables might interact with each other). In a more detailed analysis of the data, they find that the differing use of stop-and-frisk across neighborhoods accounts for part of gap by which blacks and Hispanics are stopped and frisked more than whites, but not for all of it. Another intriguing aspect of the study is that it can answer the question of what reasons--and remember, these are the reasons given by the police themselves--are more likely to uncover a concealed weapon. The UF-250 report lists 18 specific "stop circumstances" (there's also a category for "other," which they ignore). The 18 circumstances are: suspicious object, fits description, casing, acting as lookout, suspicious clothing, drug transaction, furtive movements, actions of violent crime, suspicious bulge, witness report, ongoing investigation, proximity to crime scene, evasive response, associating with criminals, changed direction, high crime area, time of day, sights and sounds of criminal activity. The question is whether some of these are more likely, as revealed by the actual evidence, to lead to actual discovery of a criminal concealed weapon than others. The authors look at these 18 factors together with each of the 77 police precincts and also whether the stop-and-frisk happened at a public housing location, a transit stop, or elsewhere. Notice that this is not an exercise in 20:20 hindsight: instead, it's looking at the circumstances that police actually reported seeing at the time, and then seeing what worked. Basically, they find that three of the circumstances were good predictors of a criminal concealed weapon: suspicious object, sights and sounds of criminal activity, suspicious bulge. The other 15 circumstances were either barely connected to finding a concealed weapon, or not connected at all. In particular, we show that one can recover 50% of weapons by conducting only the 6% of CPW [criminal possession of a weapon] stops with the highest ex ante hit rate, and 90% of weapons by conducting 58% of CPW stops. These ex ante hit rates are based only on information observable to officers prior to the stop decision, and so it is at least in theory possible to implement such a strategy. Further, since low hit rate stops disproportionately involve blacks and Hispanics, optimizing for weapons recovery would simultaneously bring more racial balance to stop-and-risk.To facilitate adoption of such strategies by police departments, we develop stop heuristics that approximate our full statistical model via a simple scoring rule. Specifically, we show that with a rule consisting of only three weighted stop criteria, one can recover the majority of weapons by conducting 8% of stops. A possible objection to our approach is that even for CPW [criminal possession of a weapon] stops, recovering weapons is not the only—or perhaps not even the primary—goal of the police. Officers, for example, may simply consider stops a way to advertise their presence in the neighborhood or a means to collect intelligence on criminal activity in the area, regardless of how many weapons are directly recovered. Stops conducted for these alternative motives could quite plausibly deter individuals from carrying weapons and might lead to information helpful in solving cases, both of which presumably would lower the incidence of violent crime over time. In the instances we consider, however, the explicitly stated reason for a stop is suspicion of criminal possession of a weapon, not one of the various other reasons that may or may not withstand legal or public scrutiny, and so it seems most natural to consider whether individuals were in fact likely to be carrying weapons. Moreover, as we have previously noted, simply because a strategy may be effective does not make it legal. ... A related worry is that “criminal possession of a weapon” is a catchall category for a variety of criminal offenses, and so by focusing on whether a weapon was found, we underestimate the value of a stop. Addressing this issue, we observe that our results are qualitatively similar if we instead use arrests [for any reason] as the outcome variable, mitigating cause for concern. By focusing on the relatively small number of high hit rate situations—situations that can be reliably identified via statistical analysis—one may be able to retain many of the benefits of stop-and-frisk for crime prevention while mitigating constitutional violations. This observation has the potential to not only improve New York City’s stop-and-frisk program, but could also aid similar policies throughout the country. The Big Question: Has Robust Growth Deserted Us?